After deciding to open his own practice, Dr. Panchal pursued a marketing company called BrainWorks to design the Genesis logo. A short time after the design, the marketing company was moving out of their building and offered it to Dr. Panchal. They moved out on a Friday and Genesis was in by that Monday. The office was customized for the marketing agency, so the offices were larger than normal doctor’s offices and the interior design was extremely unique. Chalkboard walls, track lighting and a fun chandelier made the space feel modern. Patients loved the larger rooms and how the atmosphere didn’t “feel” like a doctor’s office, so Genesis decided to keep it the way it was. The Genesis team took these elements into consideration when designing their current office space. The current offices of Genesis Plastic Surgery were built on Kelly Avenue in 2011. This move marked a transformation in the practice. One of Dr. Panchal’s favorite memories was when the entire staff worked together to create an office space they enjoyed. They implemented the larger rooms and everyone contributed to the design and atmosphere. After the move to Edmond, the business started to grow quickly, as the location was more central and easier to find. Genesis has grown immensely in the last 10 years: from helping 4-5 patients a day, to now 30-40 a day. How has the business changed? In the first year, Genesis had approximately 250 patients, mostly consisting of surgical procedures. The medical spa services weren’t as popular in 2005, only making up 5% of the services. With the introduction of new fillers, laser treatments and skin care, medical spa services began to increase, prompting the need to hire a Physician Assistant so Dr. Panchal could focus primarily on plastic surgery. Today, Genesis has treated over 5,000 patients, with medical spa services making up 20% of Genesis’ patients’ needs. Over the years, the most popular surgical procedures at Genesis have been liposuction, breast augmentation, & rhinoplasty (nose reshaping). Technology has evolved over the past 10 years as well. For laser services, the introduction of Fraxel revolutionized the way laser procedures were performed. Instead of removing a layer of the epidermis like past treatments, Fraxel’s lasers only makes micro holes in the epidermis, which means less downtime and no extra skincare is necessary. Fillers have also changed a lot in the last 10 years. Before 2005, fillers only lasted around three months and were not as consistent in the quality or longevity of the product. Now, fillers last up to five years and offer a wider variety of outcomes. This allows the doctor to customize the treatment plan for the patient, and gives patients more price points to choose from. Breast implants have also significantly improved in the last 10 years. When silicone implants became available in 2006, there was a shift away from using saline implants. When they were first released, only 15-20% of breast augmentations used silicone. Today, almost 100% of the implant procedures use silicone implants. Silicone is used more widely today because of their lifetime warranty (which is rare for a medical device), natural look and feel, and overall longevity. Dr. Panchal opened a private practice because he wanted to spend more time with his family. 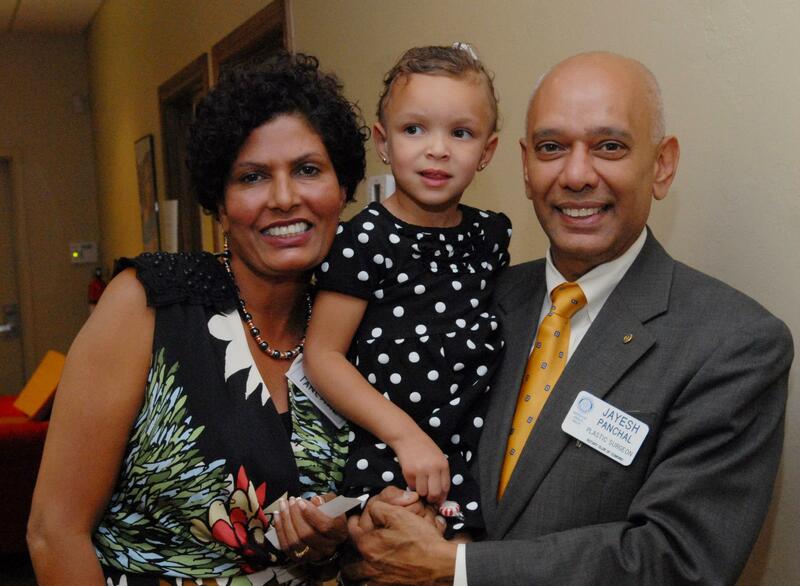 These family values have transpired throughout not only Dr. Panchal’s life, but in his practice as well. “We treat our patients as family. I know their kids, their spouses, what’s going on in their lives, etc. I’ve known some patients for the full 10 years!” said Dr. Panchal. Genesis values the patient’s needs over financial gain. “We are not pushy with sales. We don’t demand anything to be done. If the patient wants a procedure, they will ask for it,” said Tracey. Dr. Panchal values a friendly and welcoming staff. When hiring new employees, every existing Genesis employee interviews the candidate. This allows everyone to have a say in who becomes a part of the Genesis family. “In all my years of practice I haven’t had any staff issues. Everyone gets along really well and I know the patients feel that positive energy,” said Dr. Panchal. Tiffany Bankston, PA said: “We really take care of our patients from beginning to end.”The past 10 years of Genesis Plastic Surgery and Medical Spa have been wonderful, both for the Genesis staff and the patients they have served. Here’s to the next 10 years! We’d love for you to join us for our 10th Anniversary Celebration Open House Party October 6th from 4-7pm at the Genesis offices. Learn more about the event and RSVP.